Well, I decided to enter the world of bloggers for real this time...Hopefully I don't get sidetracked, as I tend to do with my busy schedule. Since I'm a mom of three little princesses, with a part-time job outside the home (teaching 2-year-olds) and a husband, as well as an online student...I would say, YEP I'm pretty busy. I DO however find time in all the craziness to pursue new culinary, crafty, or gardening endeavors. So, I decided to share them with the world! Aren't ya'll lucky!? Over the last 11 years of marital bliss (ha ha), I have developed a knack for the culinary arts. My next door neighbor, who is a chef, says I'm what the formally educated food experts call a "foodie". I am a self taught, or should I say Web/Food Network taught chef. (Also, I learned much from my mother who LOVES baking from scratch...she's a pretty good cook herself.) I love to bake and cook and am a canned food snob. Yes I still use canned goods if I must, with my crazy busy life, but I try my hardest to avoid recipes that are not mostly homemade. Stick with me on this journey and I will share many of my own creations as well as my tried and true recipes from food favorites like Paula Deen and Giada or my family favorites. So...will you join me on my continued pursuits in becoming Miss Suzie Homemaker, the gal who can bring home the bacon and fry it up in the pan...(although I don't bring home a LOT of the bacon..ha ha)...but I can do pretty much anything I put my mind to. [That must be the Croswait stubbornness in me..] Let's get started! 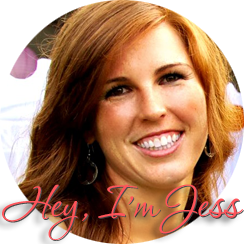 This is great Jess. I love to cook also and everything I do is homemade, except for cakes. I'm not a dessert maker except for Christmas cookies. What I did this year was grow quite a bit of basil and made my own Pesto sauce and froze it for the winter. I love experimenting. I like sewing and crocheting also but I hardly have the time to do much. But yeah, thanx for spending the time to discuss this subject here on your blog.